This June has been unusually rainy. This is called tree ear or wood ear. These damselflies flutter all summer along the creek bank. I realize I am seeing males & females. They will perch in the sunshime to show their metallic body. Like birds, the female is more drab then the male. This is monarda, also called bee balm. Its been raining almost everyday since we returned from the Dakotas. Took a hike this morning and this is what I found. It was more like wading than hiking! A large tree was uprooted along the creek bank. It will be a while before the trails dry out. Janette & I were able to squeeze in a ride today between rains. The vegetation was hanging low & dripping with the weight of the rain water. The deer flies were so voracious that we used riding masks on the horses. Glad we got a ride in. The forecast isn't looking good. I spotted this viceroy butterfly in a grassy area by the creek. have a "narrow curved black line crossing the hind wing." Found this guy on a muddy flooded trail after a rainstorm. Apollo is a very friendly, read nosey, horse. Today, he supervised Rick's digging. Walking along the creek, I noticed this turtle has an injured back leg. Looks like something tried to grab him and took his foot. I hope he heals up. We are home from a wonderful vacation. I'm always anxious to get back to the ranch. I love seeing our native wildlife. And our domestic animals too. The Dakotas offer a lot interesting things to do in addition to the national parks. Of course, almost everyone has heard of the iconic Mt. Rushmore National Monument. But have you heard of the Crazy Horse Memorial? Its also a carving on a mountain, not far from Mt. Rushmore. construction for over 50 years. It is the largest mountain carving progress. an excavation site of 58 ancient Columbian & Wooly Mammoths. at the site of an ancient sinkhole. The entire site is enclosed in a huge building, making it a good rainy day attraction. You can drive up beautiful Spearfish Canyon and see Bridal Veil Falls. or get out and hike to Roughlock Falls. Take a ride on the 1880's steam train from Custer to Hill City. Drive to Deadwood to see Buffalo Bill's grave. You just might see an old west shoot out re-enacted on Main Street. 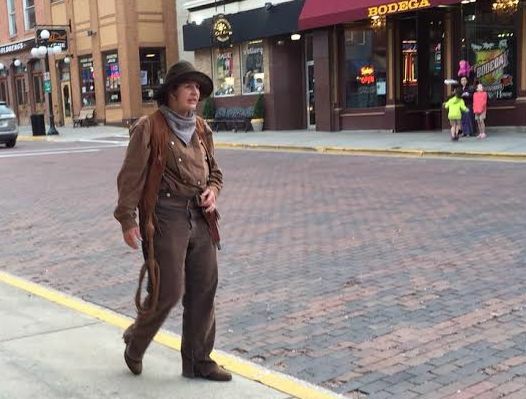 Or catch Calamity Jane walking through town. in North Dakota, near Roosevelt National Park. Its a rousing patriotic musical with a western slant, making you proud to be an American! And it even has horses on stage! As you can see, there's lots to do in the Dakotas! Roosevelt National Park is located in the North Dakota Badlands. where you can see the wildlife & geology up close. There are mushroom shaped formations called rain pillars. which was relocated to the park. The park is vast & magnificent. We arrived at Roosevelt National Park on a drizzly rainy day. Turns out that is an optimal day to see wildlife. Almost immediately we saw this small band of feral horses. This smaller filly looked like a yearling and subsequently went over to the gray mare & nursed. Hidden off by himself was this white stallion. And spotted another band of horses farther along the loop. The next day, we went back and only saw this pair. I really enjoyed seeing the wild horses. The ranger told me there are 146 horses in the park. technically, they are domestic horses that are feral.